Is the WordPress GPL Being Abused? 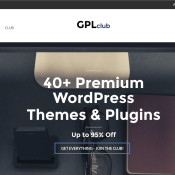 The GPL licence, which is the foundation of WordPress and all plugins in the WordPress repository, is a great licence, no doubt. It has permitted WordPress to become what it is today, and have such a wonderful community form around it. I’m however seeing a small surge in the number of people who are taking advantage of the GPL in an arguably unethical way. I’m talking of the WordPress plugin stores that are cropping up and selling plugins developed by other people. We’re not talking about ripware sites here, but rather of new and real businesses built solely on the selling of products which they themselves did not develop.